Directors observe on the video monitor as the actors go through their scene. A group of DHS students participated in a workshop presented by the Toronto International Film Festival on Tuesday. The students wrote a script, storyboarded, rehearsed and produced a short film with the help of some experienced film makers. After spending the morning in groups learning about character development and writing scripts, the students had to pitch their ideas to the other students. One script was ultimately selected for the group to develop and produce. 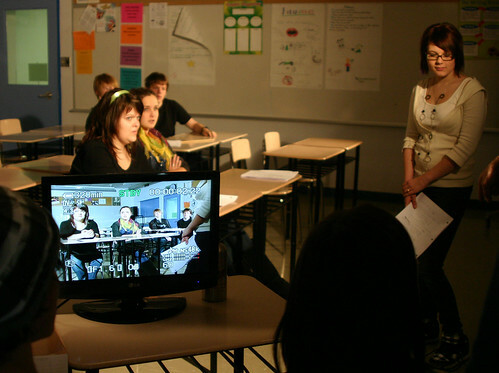 The afternoon was spent in production mode as the “set” (a classroom at DHS, in this case) was prepared with lighting and camera equipment. The students learned about camera shots and movements, lighting techniques and sound engineering. Most of the afternoon was spent rehearsing lines and taping the various shots that will make up the final product. The rough footage was taken by the TIFF group for editing, and a final product will be delivered in around two weeks.